In Bangladesh there are two types of banks. They are- government banks and private banks. Premier Bank Limited is a private sector commercial bank based in Banani, Dhaka, Bangladesh. Premier Bank Current Account helps you manage your daily finances. The Premier Bank Savings Account gives you the freedom. It is a great opportunity for the job seekers that Premier Bank Job Circular 2019 has been published recently. The Premier Bank Limited is one of the most progressive and prestigious Banks in the country. The Bank has initiated its transformation process with a new business model and strategy. In the process of the journey, the Bank is going to recruit the talents as (i) Probationary Officer and (ii) Trainee Junior Officer (Cash). The Premier Bank Limited is one of the most progressive and prestigious Banks in the country. The Bank has initiated its transformation process with a new business model and strategy. In the process of the journey, the Bank is going to recruit the talents as (i) Probationary Officer and (ii) Trainee Junior Officer (Cash). • Minimum CGPA 3.00 out of 4.00/equivalent in Post-Graduation and Graduation Degree (4 years) in any discipline from a reputed University. • Minimum GPA 4.00 out of 5.00/ equivalent in both Higher Secondary School (HSC) and Secondary School Certificate (SSC) examination. • Salary during 1st year and 2nd year of probation period will be BDT 32,000.00 (consolidated) and BDT 37,000.00 (consolidated) respectively. After successful completion of probation period POs will be confirmed as Officer with approved scale of pay. • Minimum CGPA 2.00 out of 4.00/equivalent in Graduation Degree (3/4 years) in any discipline from a reputed University. • Minimum GPA 2.50 out of 5.00/ equivalent in both Higher Secondary School (HSC) and Secondary School Certificate (SSC) examination. • After satisfactory completion of 01 year probation period the TJOs will be absorbed as Junior Officer (Cash). Salary during probation period is BDT 24,500.00 (consolidated) and after confirmation salary will be BDT 32,500.00. • During the probation period the TJOs (cash) will undergo for orientation and extensive functional training programs on different aspects of banking including Law & Practices of Banking. • Age not exceeding 30 (thirty) years as on January 31, 2019 • Excellent oral and written communication skills in English & Bangla. • IT Savvy, Strong command especially in MS Word, MS Excel and MS Power Point. 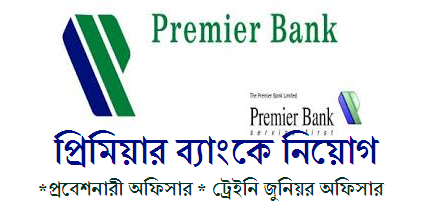 People also Search related to premier bank limited job circular 2019, premier bank trainee junior officer job circular. Premier bank job circular 2018, premier bank bd job circular 2018. Prime bank limited career, premier bank job circular 2019. Premier bank jobs circular bd. Premier bank junior officer salary. Premier bank job circular dec 2017. NCC bank job circular, private bank job circular 2018. www standard bank bd com career Islami bank bd jobs prime bank bd jobs. Premier bank board of directors grameenphone jobs Bangladesh prime bank limited career. BD jobs trust bank nrb job circular city bank job application premier bank salary structure. About premier bank premier bank job circular dec 2017 premier bank organogram . Trust bank bangladesh job circular 2018 dhaka bank job circular 2018 admit card eastern bank apply online. Previous Ministry of Industries (MOIND) Job Circular 2019 -industries minister.